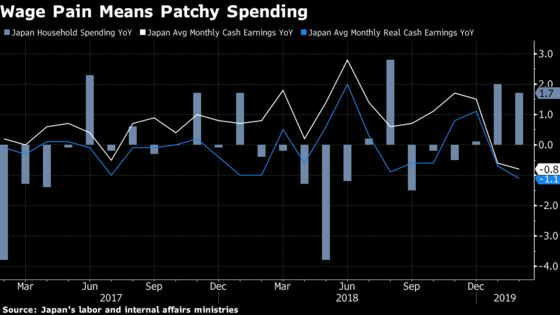 (Bloomberg) -- Japanese wages fell unexpectedly in February as the labor ministry adjusted the sample group used to compile the data, muddying the waters for analysts trying to get a handle on the weak state of pay in the economy. Labor cash earnings dropped 0.8 percent from a year ago, the ministry reported Friday, compared with projections for them to advance 0.9 percent. The reading for January was revised down to -0.6 percent from 1.2 percent. Click here to read more on problems with Japan’s wages data. Wages have mostly shown small gains in recent years amid a very tight labor market. They haven’t risen to a level that lets households spend freely enough to boost inflation. The Bloomberg Inflation Barometer, which draws on eight drivers of prices, points to a sharp slowing in the months ahead that may bring a spell of falling prices this summer. Japan needs household spending to hold up this year amid weakness in exports, which is weighing on factory output and capital investment. A sales-tax hike planned for October is expected to spark a strong rise in spending in the months ahead of the increase, followed by a sharp decline. Real wages, which are adjusted for inflation, fell 1.1 percent, compared with economists’ median forecast of 0.8 percent. The real wages figure for January was revised down to -0.7 percent from 1.1 percent. Household spending rose 1.7 percent from a year earlier, data from the ministry of internal affairs showed, versus the median estimate for an increase of 1.9 percent. The ministry said it doesn’t see households starting to rush to spend before the sales-tax hike planned in October.